A transport lifeline for a rural community is being piloted in north Wales. 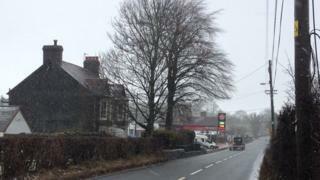 The new service will offer a link between Glan-yr-Afon on the eastern edge of Gwynedd and Corwen, Denbighshire. Public bus services to Corwen, the nearest town, were cut in 2014. Now residents will be able to pre-book a cut-price taxi two days a week, with Gwynedd council helping to fund the scheme. The pilot project will last 10 weeks, when the council will consider whether it should be extended. The taxi service will be available on Tuesdays and Fridays, costing no more than £3 for a return journey. "Public transport is very important for people in rural villages like Glan-yr-afon," said Dafydd Meurig, who is responsible for transport on Gwynedd council's cabinet. "This provides a link to Corwen enabling people to travel further afield to Wrexham and Barmouth."